and then create a piece of jewelry to remind you of your Word of the Year in this unique Workshop! Why would you want to even choose a Word of the Year? When you choose a word for your year, you’re choosing an intention of how you want to live your life. You can move through your life making decisions easier because you have a bigger goal in mind. In this workshop I'll guide you through a process to help you choose your Word of the Year. I’ll give you exercises and worksheets to fill out to help you narrow in on your Word of the Year. Then I’ll show you how to make a vision board for your Word of the Year. 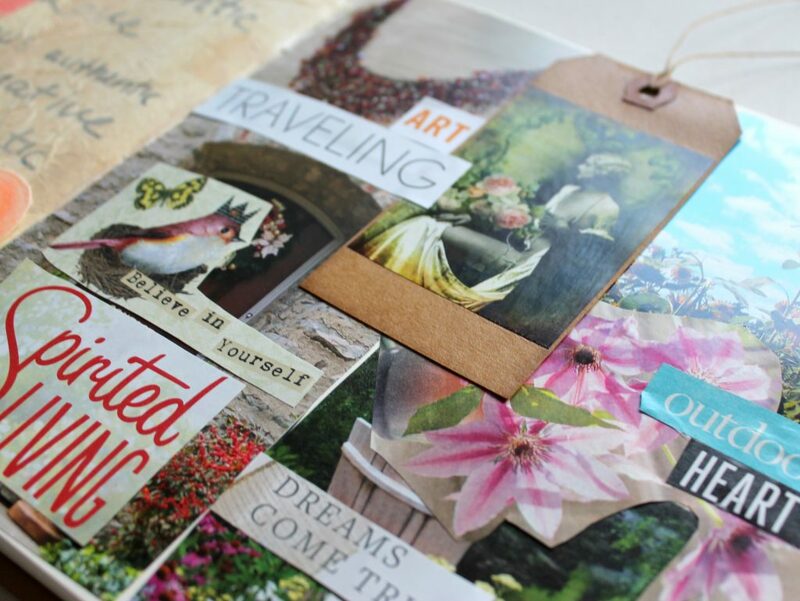 You can place your vision board somewhere you can see every day to remind you of your intention for the year. Finally, I’ll show you how to make a beautiful ring. But more than just instructions on making the ring, I’ll show you how to create an intention around the ring and choose colors and/or gemstones that represent your Word of the Year so you can use the ring as a talisman. You could go through any one of these sections of the Workshop and get your money’s worth. You could simply get it for the ring tutorial without any special meaning and it would be well worth your investment. It’s a workshop held completely online in a private classroom. It’s like going to a jewelry making workshop in person, but better! You get a bird’s eye view of what I’m doing. You can take it any time you like and in the comfort of your own home (and in your jammies if you want!) You can watch it over and over again as many times as you like. You can ask questions and get my answers. You also get a helpful PDF eBook with step-by-step instructions as well! 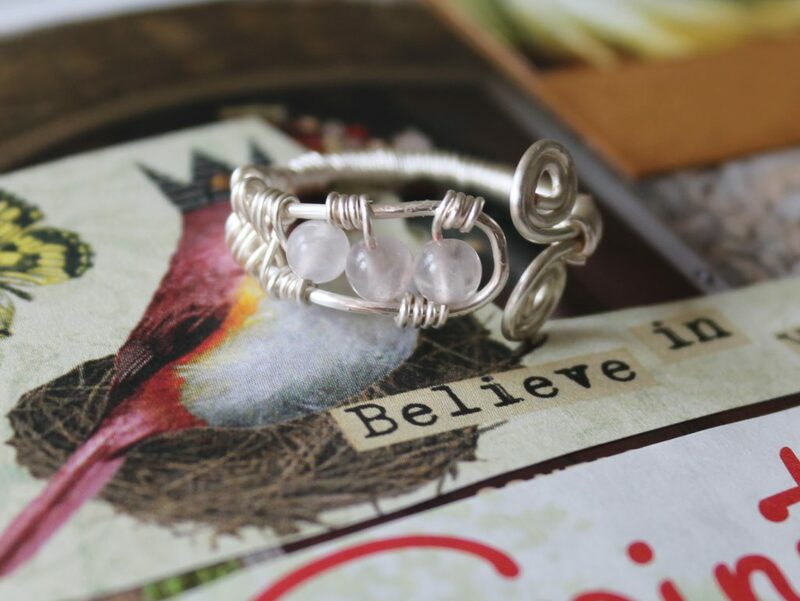 Think about the satisfaction you’ll get from taking some wire and beautiful beads and making them into a beautiful ring that you made yourself! This ring looks impressive, but it’s not so hard to make with my detailed, step-by-step instructions. My customers tell me all the time that I make things seem so simple. You can take it in your own time and watch it as many times as you like. You get a total of 8 videos in this Workshop that take you through all 3 Parts of the Workshop: Part 1 – choosing your word, Part 2 – vision board, and Part 3 – making your ring. There are worksheets for the choose your word exercises that you can print out separately. You get access to me for any questions you may have or if you need additional instruction on anything. At the end of the Workshop you’ll have chosen a Word of the Year (and an intention for the year), a vision board for your Word of the Year, and a beautiful wire wrapped ring to use as a talisman for your Word of the Year. You get to express yourself and your creativity and gain confidence in your artistic abilities. 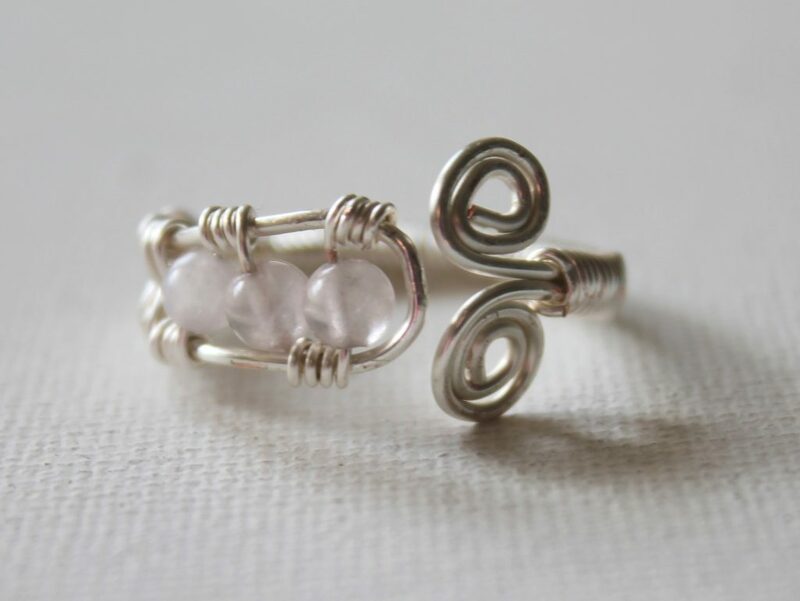 A simple wire weaving technique. Instead of the tiny, hard to see photos and complicated instructions of others’ tutorials, my instructions have clear, detailed photos and I’m often told that I make complicated things seem simple. You get videos as well showing each step in real time. I'm Kimberlie Kohler. (You can call me Kim.) I teach jewelry making and creativity. My specialty is wire wrapping and making jewelry less complicated with very clear, step-by-step photos or videos. I love sharing creativity tips and giving inspiration for creativity. Even if you haven't expressed yourself creatively since you were young, it's still in you. I have been a jewelry designer for years, selling mostly eco-friendly and funky jewelry. I've sold my jewelry all across Pennsylvania at craft shows, stores and in my own retail space in downtown Lancaster, PA. I've also sold my jewelry all over the world via my online shop. I've been making jewelry since I was a child and professionally making and selling jewelry since 2005. I have been teaching jewelry making online since 2012 and have run eCourses and eWorkshops online. My biggest inspiration is nature, but I find inspiration everywhere. I'm interested in innovative (as well as easy) ways to make jewelry; not just the regular, traditional ways. I also don't think you have to spend a fortune to express yourself with jewelry making. The jewelry project is advanced beginner/intermediate. If you have taken my free Quick Start Guide to Wire Wrapped Jewelry or really any of my jewelry courses, you should be successful with this Workshop. *Wire: You can use any metal that you like. I like to use Parawire, which is a non-tarnish silver plated wire. On silver plated or other non-sterling silver wire you may not see a hardness marking (i.e. half-hard), but most of the time it responds like half-hard wire and will be fine to use. Set an intention for your your year, create a vision board reminder and create a talisman - a beautiful piece of jewelry to remind yourself daily of that intention. 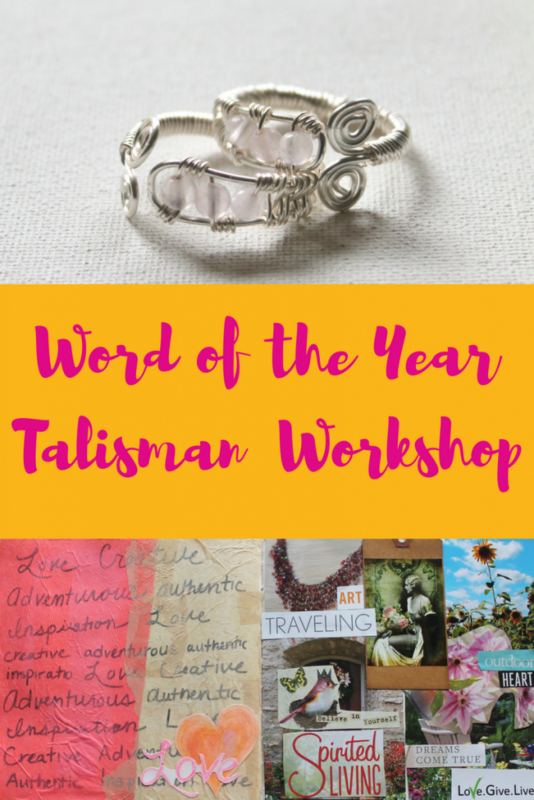 Enroll in the Word of the Year Talisman Workshop today!